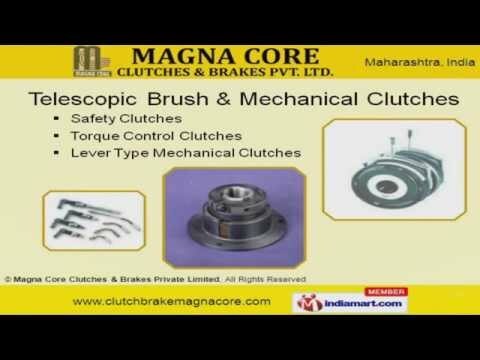 Welcome to Magna Core Clutches and Brakes Private Limited, Manufacturer and Exporter of Electromagnetic Clutches, Breaks and Telescopic Brushes. The company was established in 2005 in Pune. We are approved by Central Machine tools Institute and export to Australia, Africa and other countries. Total client satisfaction, superb packaging facilities and skilled workforce help us to achieve an enviable position in the industry. We offer a vast range of Electromagnetic Clutches, Telescopic Brush and Brakes Spares. Our Electromagnetic Clutches and Brakes are widely appreciated in the market. Telescopic Brush and Mechanical Clutches offered by us are a class apart. Our Electromagnetic Single Disc Brakes are setting a benchmark in the market. We also provide Clutches and Brakes Spares at industry leading prices. Along with that we offer Clutch Brake Unit and Gearbox that are extremely reliable.